A corten steel patio fireplace is truly something special! Terrace fireplaces come in many types and sizes. 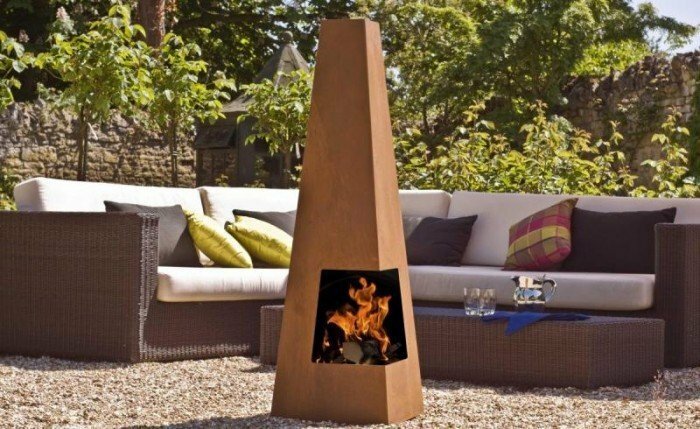 But a corten steel patio fireplace is a particularly special asset to your garden! Characteristics of corten steel are the orange brown rust colour on the one hand and, on the other hand, its long lifespan. The more you use the outdoor fireplace, the more beautiful it becomes. View the full range of corten steel terrace fireplaces below. Many patio fireplaces, patio heaters and outdoor fireplaces are made of corten steel. But fire pits, fire bowls and other garden items are often made out of this kind of steel. Corten steel is a kind of steel containing copper. Corten steel is also known as weathering steel. Characteristic of corten steel is the orange brown rust colour the one hand and, on the other hand, its long lifespan. The lifespan is so long because the first layer of corrosion prevents further rusting, making painting unnecessary and maintenance minimal. The more you use the outdoor fireplace, the more beautiful it becomes. Another important characteristic of corten steel is that the fire bowl will not rust and can stay outside all year long. To sum it up: with a corten steel fire bowl or patio fireplace, you will not only add a very special item to your garden, you can also be sure that it will last for years. Please note: It can happen that a certain type of fire bowl will not immediately have a rust-look. At first, you might think that the wrong product was delivered. Nothing could be further from the truth. When you place the outdoor fireplace outside, humidity and/or rain will soon make the first layer of corrosion appear. Often the manufacturer delivers the fireplaces complete with a recognisable corrosion layer, but it also happens that the steel is still smooth and the first ""rusting"" has yet to appear. But don't worry, this happens very quickly. We offer a lot of different models of patio fireplaces made of cortensteel. Gardenmaxx, for example, has a very extensive range. These fireplaces are made of 1.6 or 2 mm thick steel. Many models are available in both a small version and a XL version. Smaller models, such as the Rengo terrace fireplace, have an average height of 120 cm. The height of the larger models corten patio fireplaces can range from 1.50 to 2 meters. An example of a large fireplace, for example, is the Pular Corten XL. Burni terrace fireplaces are robust timeless fireplaces that can be made for shelter and can be equipped with a barbecue grille. The fireplaces are made of quality cortenstaal A 3 mm thick. A widely sold model is, for example, the Burni Stig terrace fireplace made of cortensteel.